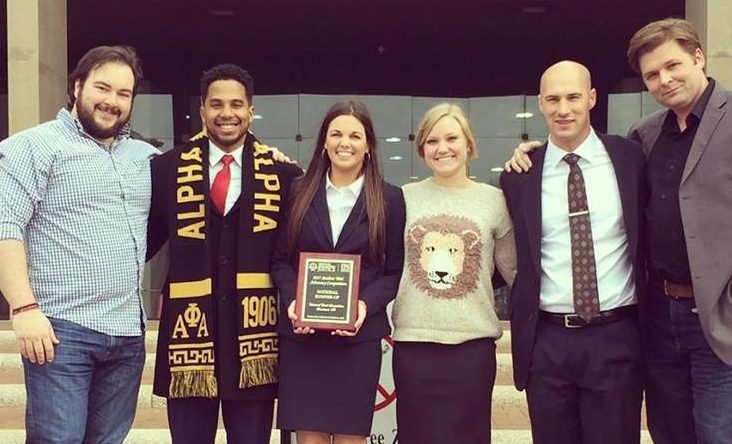 The Belmont University College of Law Mock Trial Team was just crowned second in the United States at the finals for the American Association for Justice National Student Trial Advocacy Competition this past weekend in Cleveland, Ohio. Belmont advanced to the national tournament after winning first place regionally, securing the regional trophy for the third time in four years. The American Association for Justice (AAJ) seeks to inspire excellence in trial advocacy through training and education for both law students and practicing attorneys. The annual nationwide mock trial competition provides opportunity for law students to develop and practice their trial advocacy skills before distinguished members of the bar and bench. For the competition every school has a four-person team with two people serving as attorneys for the plaintiff and two serving as defense attorneys. During a round, the team members who aren’t competing play the roles of witnesses for their teammates. This year’s competition centered on a fictional premises liability case, one in which the owner of a business was being sued because someone was injured on the property. Belmont’s mock trial team included current third year law student Kierstin Jodway and second year students Paul Fata, Marcerious Knox and Summer Melton, and the team was coached by both faculty and alumni over the past several months. The head coach of mock trial at Belmont University is Professor Andrew Caple-Shaw who helped start the program and continues to coach teams each year. At the national competition, Belmont had one of the toughest preliminary draws, facing and defeating three of the nation’s top teams in University of Akron, Loyola Marymount and Syracuse. They also eliminated University of Missouri-Kansas City and Chicago-Kent before falling to Wake Forest in a nail-biting final. The point margin of the loss was a mere four points on a scale of 180. Other regional winners that the Belmont team ultimately outranked in this national competition included Harvard University, Chicago-Kent College of Law, Baylor University, Stetson University, Fordham University, University of California Davis, Tulane University and the University of Maryland. At the regional level, the Belmont team edged out a number of strong competitors as well including Notre Dame, Vanderbilt and University of Tennessee.